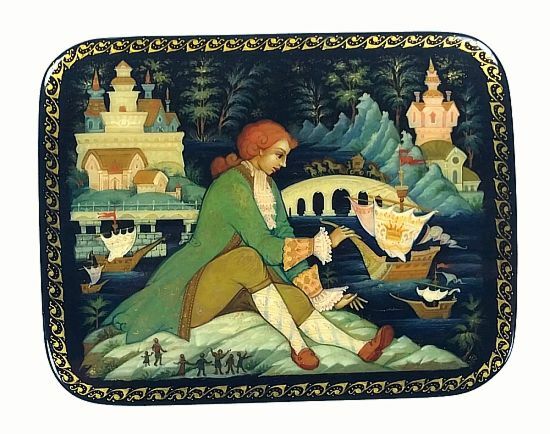 This tall chest by Galina Mochalina is based on the Jonathan Swift's novel "Gulliver's Travels". The book consists of a series of voyages to different places by Gulliver, and this box depicts a scene from the first voyage to the island of Lilliput, inhabited by tiny people. Right next to Lilliput, separated by a channel, are the people (also tiny!) of Blefuscu, and where Gulliver, at the request of the Lilliputians is stealing a ship from the fleet of the Blefuscudians. Not sure which side of the channel Gulliver is on here, but from the looks of the little people at the bottom of the drawing, who are throwing their hands up in the air, he may be on the Blefuscudian side! Gulliver grabs the bow of the ship as if it is a toy, and the artist purposely distorts the perspective so that distant objects magically, and literally, become close at hand. Meanwhile, in the background, small horses can be seen pulling a carriage, with royalty inside, watching the spectacle. All of the objects and scenery are beautifully accented with radiant gold. Gulliver himself is handsomely drawn with his long flowing hair and sharply defined features. The architecture and ships on top look great, but it is on the sides where these images really make an impact as they are transformed into the elaborate gold and silver ornamentation on the box. The bottom of the work has a slightly concave shape so only the edges on two sides touch the surface. The box is made out of paper mache and has a hinge at the top. On the lid of the box, at the bottom of the drawing, the artist writes her name, village, title and year of completion.